Tempered Spirits is officially one year old! Huzzah! Cue the music! The site has come a long way since the first post, which covered the Martini, and to celebrate the fact that the blog has survived a trip around the sun — I’ve never been one for keeping journals, logs, or web sites — I mixed up a new drink that’s fresh out of Seattle and perfect for long, hot summer afternoons. Let the cocktail remain ever-green! Shake with ice, then pout into a Collins glass filled with crushed ice. 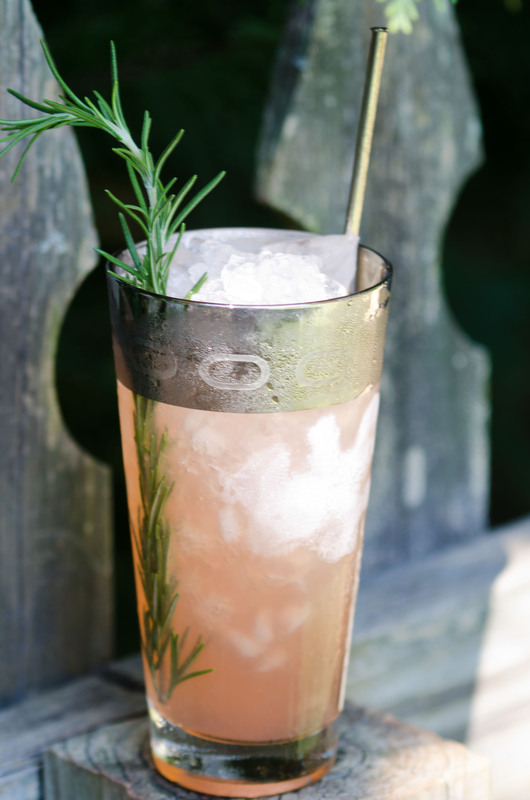 Stir with a spoon or swizzle with a swizzle stick, top off with more crushed ice, and garnish with a sprig of rosemary. Serve with a sip-spoon or a straw. 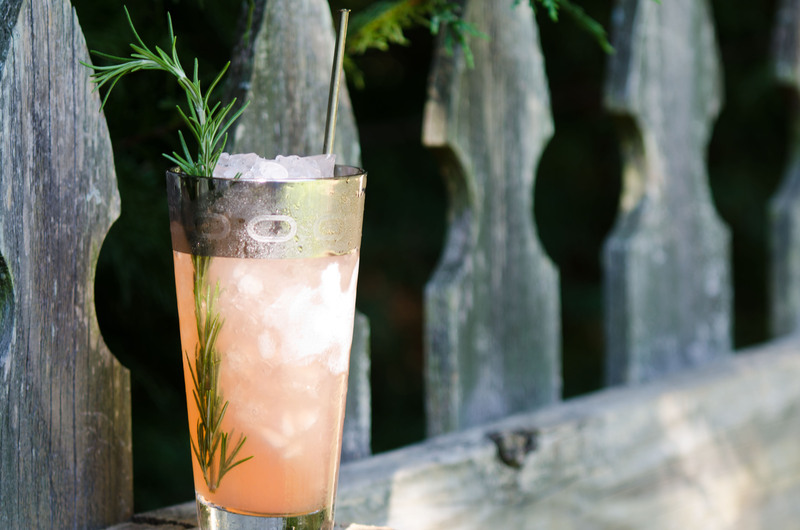 Tall, cold, and herbaceous, with the perfect amount of sweetness, the Evergreen Swizzle is built for long-term sipping. As a bit of a birthday present (for the site, you understand) I picked up a bottle of Edinburgh gin (dig the Art Deco bottle), allowing me to make the drink as the estimable Jamie Boudreau intended. In a way, the E.S. reminds me of the Last Word transformed into a tall drink, though the maraschino is nixed in favor of Zirbenz, emphasizing the gin’s pine notes. Pine liqueur is interesting stuff, should you be able to locate it — it’s not nearly as “piney” as gin — juniper can get rather harsh; instead, it has a kind of nutty, resin-like flavor combined with the sweetness of a liqueur, not to mention a beautiful, reddish amber color, which turns drinks pink (combine it with gin and citrus and you have a drink that’s sure to please). There you have it: a short, celebratory post. ‘Scuse me while I sip my swizzle in the shade. PS: As you know by now, I’m a big fan of the Small Screen Network and their cocktail shows, and Robert Hess and his videos played a major role in my cocktail education (searching for the perfect margarita recipe is what lead me to them, initially). That being said, I find it fitting that we celebrate the anniversary of the blog with a drink pulled from SSN’s catalogue. I hate to sound like I’m plugging the site, but I really am enthusiastic and grateful. I am reaching out to you on behalf of my client, High Liquors, a new super premium beverage company featuring the first full line of premium spirits: vodka, tequila, whiskey, and rum. They will be launching in Atlanta next month and the owners would love to set up a tasting and discuss possible events or other opportunities. I’m currently compiling the contact list so I was hoping you could provide me with the best person to contact, along with their email address and phone number they can be best reached. This entry was posted on June 26, 2012 by IJ Lauer in Drink Recipe, Gin, Lime Juice, Pine Liqueur, Yellow Chartreuse and tagged blog anniversary, edinburgh gin, evergreen swizzle, lime, tempered spirits, yellow chartreuse.